Received Gifts are visible in your User Profile, as well as in the Garage, in the "Gifts" section. The profile only shows the number of gift items of each type received, which is public information, while in the garage section you can view details for each individual gift: when it was sent, who sent it and the message they wrote. Keep in mind that only the 100 most recent gifts will be shown in both, the garage and the profile. If you already have 100 gifts, upon receiving the next gift the oldest gift you have will be removed. It is possible to delete individual gifts from the garage, although this will not affect the total count in the profile. Note: Gifts can only be sent to friends, unless the recipient has enabled the "Accept gifts from all players" from their Settings. Also, if a user is banned, their message will be replaced with a standard note. To view received gifts, open your Garage and click on the Gifts tab . 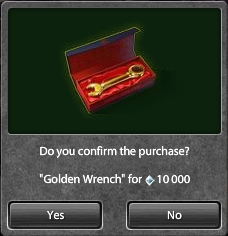 Once there, select the gift you want to view and click it. You will be able to see who sent it, when it was sent, and right below the date, the attached custom message. If you do not want to keep a Gift, click on its Delete button while viewing it. Description A branded badge is the best way to tell a friend that he's a real tanker. Description Send a thumbs up to someone who has impressed you in a battle. Description A thumbs down is the perfect answer to anything you don't like. Description A tank helmet is an essential piece of equipment for any seasoned player. Description A Tanki statuette granting +1 to coolness. Description The best way to confess your feelings to someone you care about. Description Sometimes you just end up playing in the same team as these guys. That hurts, we know. Description A gift for those who sacrifice themselves for the greater glory of the team — the best team player a team could ever wish for! Description Send this gift to a tanker whose tracks rarely touch the ground; someone who has transformed a massive beast of metal into a light and nimble creature. Description Congratulate someone on another milestone in their breathtaking rise to the top! Description For the tanker who takes control of the territory by destroying the opposition with tactical cunning and sheer force — the King of the Hill. Description A gift for those who have made it their mission to preserve the life of their team mates. This is their calling, and for this, they deserve the highest recognition. Description Wish someone a "Happy Birthday" with this gift, and show them that this is a special day, not just for them, but also for all of their tanker friends. 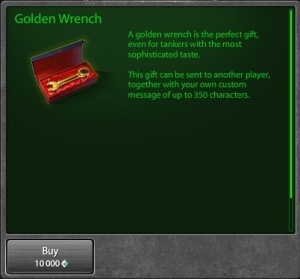 Description A golden wrench is the perfect gift, even for tankers with the most sophisticated taste. Description The legendary Blue Sphere. Yep, this is it. Description This holiday season, instead of making your tanker friends chew on your bullets, give them this sweet sugary treat to chew on. Description A gift for the tanker who likes to enjoy the hypnotic sight of falling snow while ripping through enemy tanks in the arena during the holiday season. Description A tasty Tanki-themed treat to share with your favorite arena buddies. Description Trick-or-treat is only fun if there's some candy to be gained. But be careful! Too much of it can be bad for your teeth. It's better to share some with your fellow tankers! Description Horseshoe is a symbol of good luck and happiness. Gift it to a friend who you trully wish to win in Crazy Weekend. Description Relives any fatigue and provides new strength to get back into tank demolition, or so we hear. Description Magically raises the chance to win a Dream Tank. Or maybe doesn't. 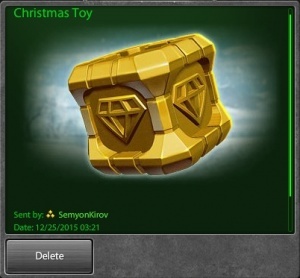 Description This gift can be sent to another player, together with your own custom message of up to 350 characters. Description If you have a friend who can't play a battle without screaming "NOOOOB," "MULTTT" or "HACKERZZZ" every 15 seconds, you can send them this ice-cream cone to help soothe their sore throat. Description The perfect gift for someone who's suffering under the brutal onslaught of the summer sun. Description Send this gift to a friend who's champion at surfing over other tankers and capturing the Gold Box like a pro surfer catches the wave. Description Crop circles. Anyone can make these: take Firebird with any hull and spin round and round burning out the circle. Description This helmet is made out of a multi-layered tin foil. Unique coating stops everything: radiation, radio waves and thinking abilities. Description Learn this gesture and you'll be recognized at any intergalactic conference. Description This ribbon is awarded to the tanker who has shown valor and determination in the face of overwhelming odds. Description The marks on a tanker's helmet tell stories of days in the battlefield. This is the perfect gift for the tanker whose helmet often finds itself with one too many dents. Description When the skies on the battlefield turn dark, and all seems lost, this gift is a reminder that the light of hope is the last to die. Description A miniature model of everyone's favorite rock. Created especially for tankers who want to feel like they have the whole world in their pocket (literally). Description For the tankers who are tired of being tied to the arena floor and would rather have their head up in the clouds and far, far beyond. Description An action figure to commemorate the first manned space flight made on April 12, 1961 by the 27-year-old Russian Soviet cosmonaut Yuri Gagarin. At the push of a button, this action figure will recite the complete contents of a random space engineering manual, in Russian. Unfortunately, sound doesn't travel in space, so you won't be able to hear it. Description Everybody loves surprises, and this is definitely one surprise your friends won't expect. This gift might not make them cry tears of joy, but watery eyes are definitely guaranteed. Description This is a great little trick to play on fellow tankers who are always day dreaming and not paying much attention. If you can pull off this trick without them noticing, they'll go from having their head in the clouds, to having their teeth on the floor. Description Warriors can look good too, and nothing says "classy tanker" like a full pair of red lips. Description Something tasty but alcohol-free, because you shouldn't drink and drive, especially when in a tank. Description For the sophisticated tanker who would like an alternative to heavy combat boots. Description Cold feet are no good in the heat of combat. These socks will keep a tanker's feet warm and his/her courage burning. Description An essential tool for the veteran warrior who wants to scout the terrain and use it to his/her advantage. Description A symbol of the elite ranks. Wearing the Crimson Beret, signifies skill and courage in battle. Description A nice way to give your warmest wishes to someone you care about on Valentine's day... or finally confess your love to that person you keep thinking about! Description Scratches on the helmet speak of the days Tanker spent in battle. New helmet is the best gift for a Tanker with a heavily daunted helmet requiring a replacement. Description This exclusive jewellery is only for the chosen who deserve to wear it. Send it as a gift to your best and most cherished friend. Description Symbol of the legendary fighters who lead battles with armadas of tanks. A-a-a-a-ttention! Description There can't be a birthday celebration without presents, and this little box packed with ones and zeroes, wrapped in colorful wrapping paper and sporting a fancy ribbon, is just perfect for the occasion. Description Celebrate Tanki's birthday with your fellow tankers by handing out this delicious piece of cake. It's perfect for weight watchers too because it only contains digital calories. Description This is the perfect gift for any eSports fan in your friends list. It's a cool keychain featuring the favorite combo of every eSports champion. Guaranteed to be a hit in any tanker's gathering. Description This day is for you, so send this gift to all your fellow tankers! Description +1 to celebration vibe. Spread as many as you can to get the party started! Description Moist sponge, delicate cream, chocolate glaze... too bad its only a picture. Description A unique, time-limited gift, available for the duration of Iron Days only. Description A masterpiece from the best Mexican chefs. Share it with a friend or throw it at an enemy. Description This tree belongs to everybody's garage! Description Everyone knows him and everyone has once built him! Description Everyone wants a Gold Box, and this one can even be hang on the Christmas Tree! Truly amazing!